Is this the best value big brand 40-inch TV around? Judged purely on size, possibly, but it's not without a large number of flaws. Put Wi-Fi, smart TV, Freeview HD and a 40-inch screen on your shopping list and you're unlikely to find anything under £600 from a brand you've heard of. The exception - as ever - is Toshiba, whose commitment to producing the ultimate everyman TV at a digestible price continues apace with the 40L6353, a 40-inch edge LED-backlit LCD TV that's going for £599 (around US$935 / AU$1,020). It's 82mm (3.2 inches) in depth - not exactly slim - but those with existing AV tables won't care a jot about that. Even the 15mm (0.59-inch)-wide bezel is pretty easy to live with, while the gloss black styling with a fake metallic strip is 'a bit 2012' at worst. It uses a 100Hz panel with Full HD resolution, too, while its smart TV antics - called Cloud TV by Toshiba and new for 2013 - cover all the basics. BBC iPlayer, Netflix and YouTube and all here. Heck, the Freeview HD tuner even has a basic one channel-record function if you've got a spare USB flash drive on top of digital file playback. Our only concern is picture quality, which has surely dropped down the priority list for Toshiba to reach such a low price. Or has Toshiba - which has fitted the 40L6353 with its regularly impressive Resolution+ circuitry - achieved the impossible? The only other TV in the Toshiba L6 Series is the 32-inch Toshiba 32L6353 (£485). But if you're after the company's most advanced sets, head for the step-up Toshiba L7 Series. 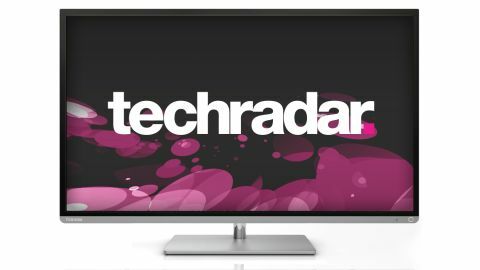 As well as Cloud TV and all the other features found on the L6, you'll find active shutter 3D, two pairs of 3D specs and a slimmer design across bigger screens; the 40-inch Toshiba 40L7355 (£650) and 50-inch Toshiba 50L7355 (£750). Further down below the L6 Series is the almost ludicrously low-priced Toshiba L4 Series, which comprises the 32-inch Toshiba 32L4353 (£400), 39-inch Toshiba 39L4353 and 50-inch Toshiba 50L4353. Outside of the Toshiba range, the TV's closest competitor is the Finlux 40F8030-T, which sits at a similar price point and has a similar spec. Buy a TV as big as this for such small bean and there are bound to be a couple of annoyances. So it proves with the Toshiba 40L6353, which surprises us with an impressive four HDMI inputs, but then puts three of them on a messy side panel. The trio is alongside two USB slots. There is a fourth HDMI input on the rear panel, but unfortunately it points out rather than downwards. A similar fate awaits the other ins and outs around it; a set of component video inputs and associated phonos, a full RGB Scart, a D-sub for connecting a laptop the old analogue way, a wired LAN port, optical digital audio, and a feed for its Freeview HD tuner. We love the idea of a TV being the home hub, interacting with other devices but always staying in charge. It's a great idea - but Cloud TV isn't the answer. To be fair, no smart TV platform totally succeeds, but we fear that Cloud TV's grand ambitions are rather wasted. Its central Zeebox-style Twitter feed that creates 'social TV' is going to annoy many users, while the chance to use an on-screen Cloud Calendar widget - and create separate accounts for Cloud TV itself - is similarly unlikely to have mass appeal, despite the presence of some basic recommendation software. Who is seriously going to input appointments into a TV app using long-hand text entry on a remote control? Owners of Toshiba's apps, that's who. A basic, free Toshiba Remote app for Android or iOS failed to link to the Toshiba 40L6353 in our test, but there's a further app called Toshiba TV Media Guide - again for Android or iOS - that effectively relieves the Toshiba 40L6353 of TV scheduling duties, despite the TV's own EPG being one of its high points. As if that wasn't enough, iOS users also get Toshiba Cloud TV, which ports the fiddly functions such as Cloud Calendar, though confusingly there's no iPad version, just iPhone. Without that, or any kind of Android version, it's a half-baked idea, and the reward for time-consumingly creating an account online, entering email addresses using on-screen keyboards, and linking the various devices by 8-digit codes is a less than intuitive experience with a looming central question: what's it all for? We're convinced that almost nobody will get as far as we did with Cloud TV. The choice of apps is also an issue. During our review we were presented with Featured apps from BBC iPlayer, YouTube, Netflix, BBC News, Blinkbox, BBC Sport and Facebook. Hidden behind a More tab is a page of apps that adds the likes of Viewster, KnowHow Movies, Live Sport TV, Vimeo, iConcerts, Funspot, Woomi, Euronews, Aupeo and Daily Motion, though a few other apps - notably France 24, CineTrailer and eBay - appear only on the TV & Movies tab. Separately presented are links to a web browser, Skype, Intel's Wi-Fi screen mirroring, and links to the Toshiba 40L6353's digital media player. Hardware-wise, the Toshiba 40L6353 has the basics it needs - besides a dual-core processor, sadly - to perform reasonably well with pictures. The most important feature in this regard is a panel with a 100Hz refresh rate. It's accompanied by a decent colour management system for tweakers, though the TV is well served by some well-judged picture presets for a decent out-of-box set-up.